Alloy wheel repair and colour change. We was asked if we could revive a set of alloys off A Citroen C2 and this was the result ! The customer was very happy with the outcome ! Alloy wheels repaired and painted ! Unfortunately it’s all too easy to chip or scuff your alloy wheels whilst out driving, even if you’re a very careful driver. Kerbing your car whilst parking can happen to the best of us, scratching and damaging wheels and generally making your car look a bit scruffy. Luckily our technicians can help with our alloy wheel repair service – read on to find out more. We start off by sanding the damage to blend the repaired area with the rest of the wheel. Any major damage is filled in using a specialist resin to reconstruct the shape and contour, and then the wheel surface is scuffed so the fresh paint can stick to it. After covering the wheel and vehicle to avoid overspray, we apply quality primer to cover the repaired area. We match the paint colour using a series of colour swatches or by using the manufacturer’s paint code. This paint is then applied by spray gun before using a clear lacquer to seal the wheel and give a sleek high gloss finish. We then dry everything off using infrared brake lamps. 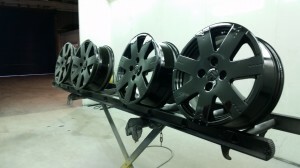 When dry, the wheel is finally buffed to give a high gloss finish, leaving your alloy wheels refurbished and as good as new.